A cleverly designed family home - with floor plans included! A cleverly designed family home—with floor plans included! 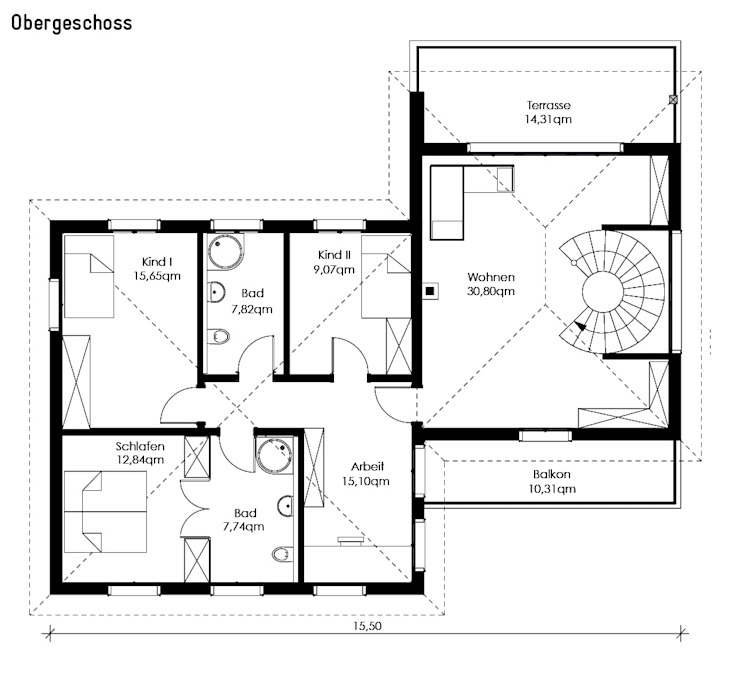 Haus Falkensee I is a stylish and spacious country home designed by the architects at Muller’s Office. This double-storied residence comes with open and bright living quarters, and is surrounded by verdant and well-kept gardens. The interiors are mostly done up in white and light shades of wood for an airy and lightweight look. Glass windows and large terraces ensure that the inhabitants get to embrace nature’s beauty throughout the day. 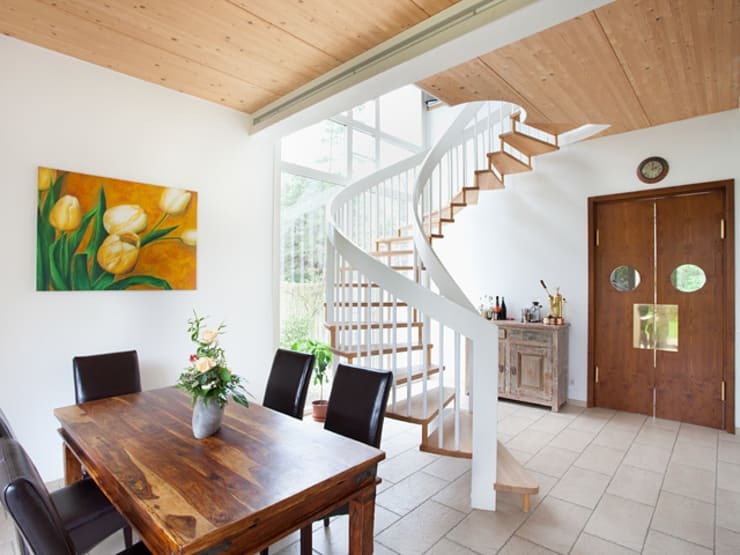 The kitchen is a vibrant surprise, while the staircase is a designer affair entirely. Let's explore more in pictures! 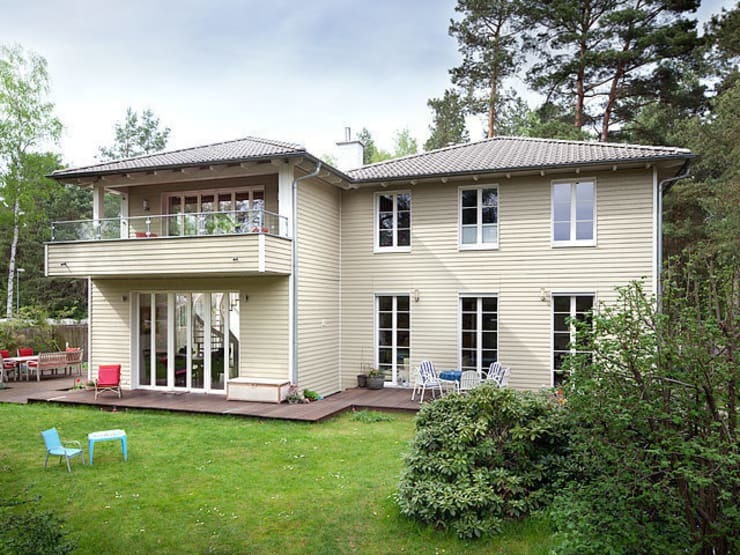 The large and sprawling house exudes countryside and classic charm, thanks to the gently sloping roofs and soft neutral hues on the exterior walls. Plenty of tall glass windows set in sleek white frames ensure that the interiors stay flooded with sunlight during the day. A sleek wooden deck runs around the building and offers ample scope for relaxing in the evenings or on weekends. The fresh green lawn is perfect for active kids who want to run around. Here’s a look at the side of the house which is partially concealed by lush and tall trees. The floor-to-ceiling glazing on this side gives you a subtle peek into the beautiful staircase inside. 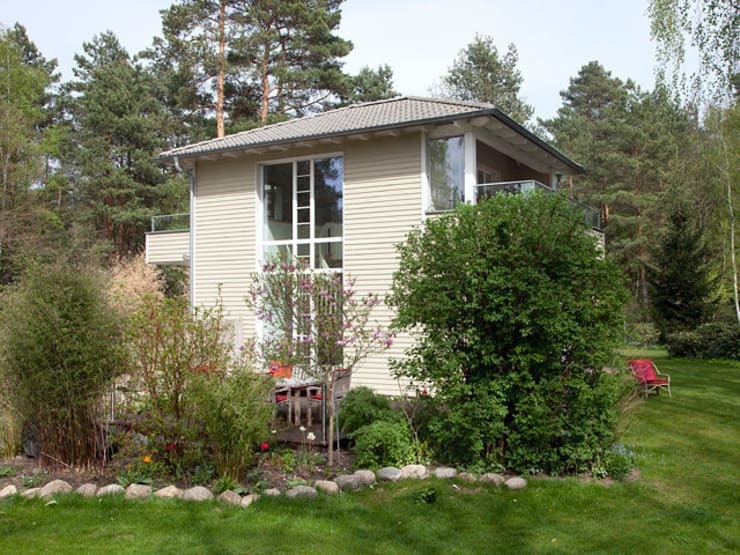 It is also evident that the property is situated in a wooden area, far from the bustle of the city. 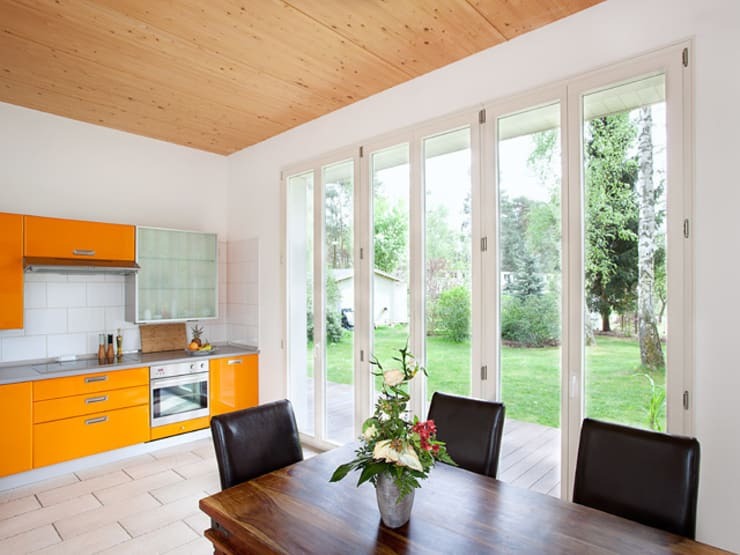 The dining space overlooks the lush green backyard, thanks to the sleek glass doors which bring in fresh air when kept open. Trendy black chairs surround a simple wooden table for pleasurable mealtimes, while the open kitchen wows with its splashes of sunny yellow. Just a little way off the dining space begins the beautifully winding staircase that takes you upstairs. With sleek wooden steps and neat white balustrades, the stairway looks so lightweight and refreshing! Now you get to take a better look at how the stairway appears from upstairs. 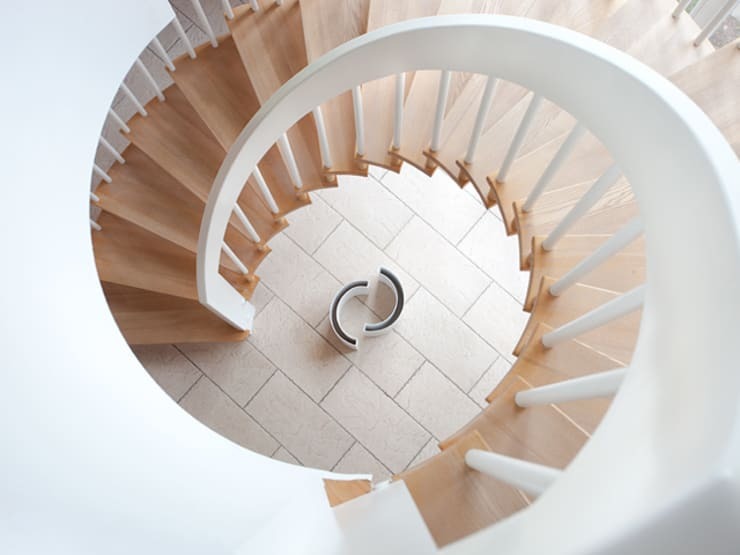 Composed of light-hued wooden steps and pure white railings, it looks like a swirl of flavoured ice-cream! The smoothness of the design is stunning. The large and airy terrace upstairs features a cosy wooden floor and sleek glass and metal balustrades for a contemporary look. The stylish recliners wait for you to relax under the stars, breathe in fresh air and admire the abundant greenery. 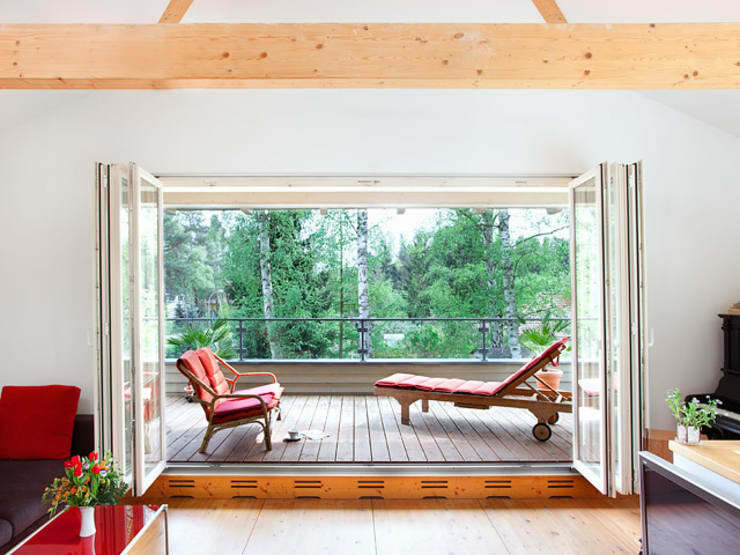 Folding glass doors open up the interiors to the terrace, and enables adequate ventilation. 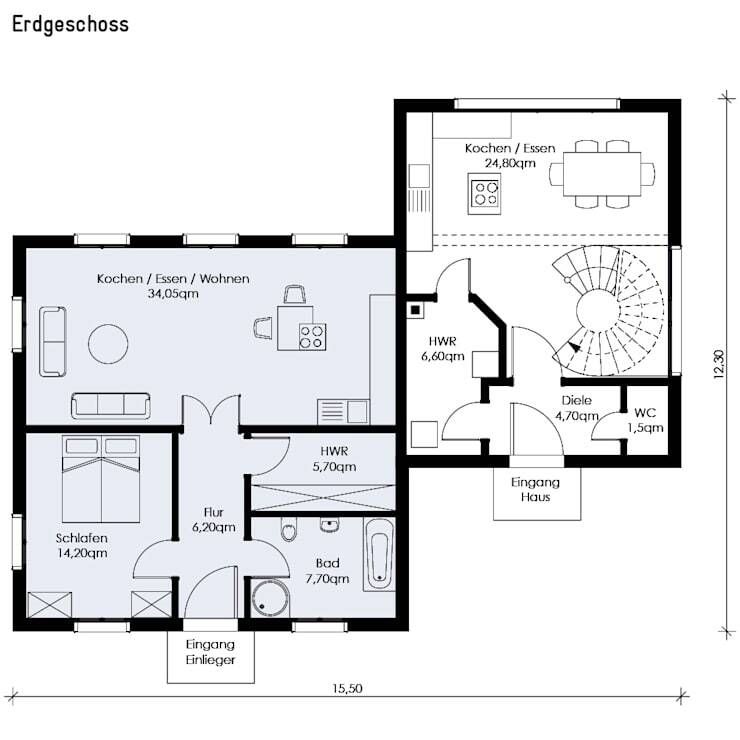 You can clearly see from this floor plan how the house comes with spacious common areas like the living, dining and kitchen. There are two entrances and ample space has been devoted to the bedroom and bathroom as well. The second floor comprises of large bedrooms and bathrooms, and a spacious seating zone which opens up to the terrace and balcony on either side. Inspired by this elegant and modern country house? Here’s another you're sure to love: The coolest container house you'll ever see. Has this family home inspired you?